Pope Benedict XVI : Laying the Groundwork for a Sustainable Civilization ? 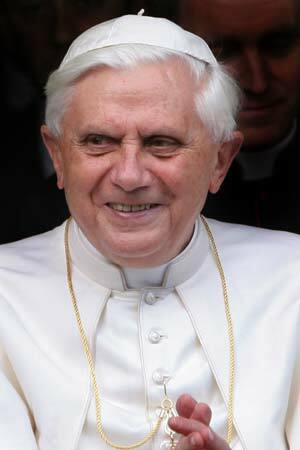 Rumour has it that Pope Benedict may address climate change during his visit to the United Nations this week. Whether he does or not, his young papacy can claim to be the “greenest” ever. Benedict has identified extensive common ground between sustainability concerns and a Catholic worldview – adding weight to the argument that the world’s religions could be instrumental in nudging policymakers and the public to embrace sustainability. Now, the Pope has the opportunity to further develop the links between sustainability and religious values, markedly advancing thinking in both arenas. Benedict’s predecessor, John Paul II, made important environmental statements during his long papacy, but Benedict is the first “green pope.” Last year, the Vatican installed solar panels on its 10,000-seat main auditorium building, and it arranged to reforest land in Hungary to offset Vatican City’s carbon emissions, making it the world’s first carbon-neutral state. And Benedict has repeatedly urged protection of the environment and action against poverty in a number of major addresses. His next encyclical (major papal teaching), due out this summer, is expected to further wrestle with environmental, social, and other themes of interest to the sustainability community. John Paul II added a spiritual dimension in Centesimus Annus in 1991, critiquing “a style of life which is presumed to be better when it is directed towards ‘having’ rather than ‘being,'” and urging people to “create life-styles in which the quest for truth, beauty, goodness and communion with others for the sake of common growth are the factors which determine consumer choices, savings and investments.” The Church’s spiritual and social teachings are rich complements to modern environmental arguments against consumerism. Benedict’s challenge is to move longstanding Church teaching into concrete action. Despite the extensive archive of papal statements on the subject, there is no evidence that Catholics consume less or differently than anyone else. Yet given that 40 percent of the human family lives on less than $2 a day while the prosperous among us consume casually and wastefully, Catholic leadership in redefining “the good life” away from accumulation and toward greater human wellbeing and solidarity with the poor cannot come soon enough. Benedict will need to be creative in persuading the comfortable in his Church to take consumption teachings seriously. The dramatic equivalent of solar panels on a Vatican rooftop may be needed to move prosperous Catholics to critically assess their own consumption-and to find joy in consuming less. The other issue, population, is more difficult for a Catholic leader to tackle, especially one with Benedict’s reputation for doctrinal strictness. For Benedict and most Catholics, human reproduction is a domain infused with questions of deep personal morality. But a pontiff who appreciates the epochal nature of the sustainability crisis must surely also recognize the moral challenges raised when human numbers grow exponentially in a finite world. How much of modern hunger, disease, poverty, and environmental degradation can be blamed on population sizes that have exceeded the carrying capacity of local, regional, and global environments? The share is unknowable, but surely not small. The challenge for Benedict will be to apply his formidable intellect to harmonize the personal and social ethics of population issues. Benedict’s interest in sustainability issues comes not a moment too soon. The sustainability crisis is civilizational in scope and depth-and therefore a natural concern for a global institution like the Catholic Church. Should Benedict raise the twin issues of consumption and population to the level of theological and spiritual attention they deserve, he would not only advance thinking on religious ethics-but also on how to create just and environmentally sustainable societies. Gary Gardner is a senior researcher at the Worldwatch Institute, an environmental research organization based in Washington, D.C. He is the author of the book Inspiring Progress: Religions’ Contributions to Sustainable Development.